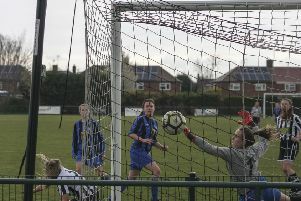 Eye United and Yaxley Lynx were both impressive winners in the battle for the Peterborough Youth League Under 15 Division One title. Table-topping Eye won 7-3 against Hampton with Harry Catanach and Obabiyi Taiwo both firing trebles, while Lynx saw off Netherton Falcons 4-0 thanks to strikes by Jordan Harris, Liam Hatfield and Harry Whittingdon and an own goal. Eye still lead by seven points but Yaxley have two games in hand. Eye are also in with a shout of a title in the Under 16 age group. They are second in Division Three - two points behind March Saracens with a game in hand. Their latest success was a 4-0 win at Blackstones thanks to doubles by Richie Townsend and Christopher Wade. Saracens were manwhile winning 8-3 at Outwell Swifts with goals by Archie Murfitt (2), Myles Ola (2), Harry Davey, Fradley Dilloway, Declan Jackson and Curtis Oldroyd. Bourne Under 18s walloped Riverside Purple 10-0 to go level on points with Deeping at the top of Division One.Declan Earth scored four of their goals.